Electrical safety solutions specialist Bender has launched the new isoHR685W-D-I-B for subsea cable insulation monitoring. The insulation monitoring devices from Bender offer plant operators reliable electrical safety technology. Unwanted interruptions of operation or system failures are avoided, which significantly reduces the maintenance effort of the plant. At the same time, the devices show an early trend of the insulation resistance. The globally proven ISOMETER® series iso685 has now enjoyed strong growth with the new isoHR685. This device variant is able to measure insulation resistances up to the 10 GΩ range and thus meet the needs of customers within demanding industrial sectors, for example the oil and gas industry. The new insulation monitoring device ISOMETER® isoHR685W-D-I-B is designed specifically for subsea cable monitoring to provide earlier advance warning of cable degradation and failure. A noteworthy feature of the isoHR685 is its ability to monitor long, parallel and capacitively coupled cables. The isoHR685W-D-I-B continuously monitors cables up to 10 GΩ, delivering a huge performance improvement compared to previous versions. By means of a type of synchronisation, interference from neighbouring monitoring devices is suppressed and filtered out. This allows monitoring cables longer than 100 km, in which various unearthed power supplies (IT systems) are routed. It does not matter whether the IT system is implemented as an AC, a DC or an AC/DC system. 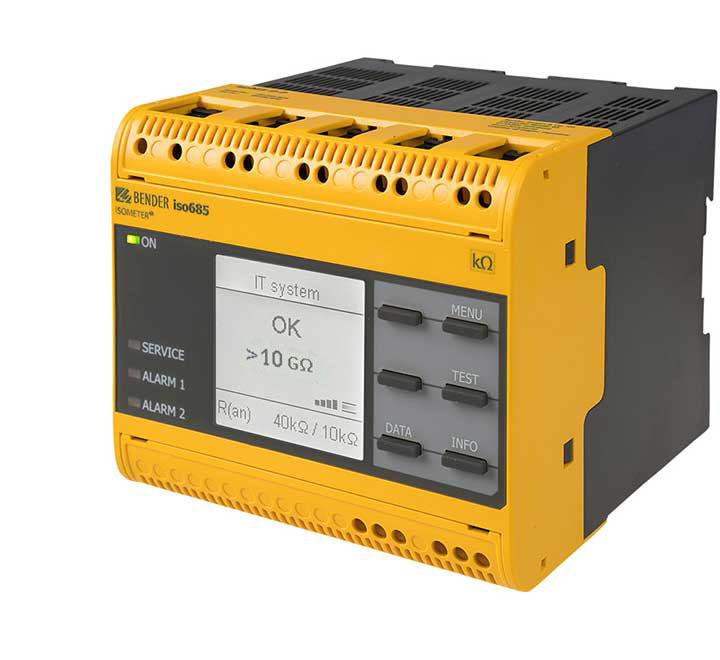 The isoHR685W-D-I-B, an insulation monitoring device that complies with the device standard IEC 61557-8, is therefore suitable for monitoring IT systems and can be used in systems with nominal system voltages of AC 1,000 V and DC 1,300 V. In combination with coupling devices, the nominal system voltage range can be extended to AC 12 kV. The extended AMP measuring method used is suitable for all systems and continues to determine the system leakage capacitance. In long cables such as those encountered, for example, in the oil and gas industry to supply oil production facilities installed on the seabed, energy lines, hydraulic lines and communication lines are grouped together in what is known as an umbilical cable. Since these cables are custom-made, have very long delivery times and are also extremely expensive, it is of great benefit to interpret the trend of the insulation level developing within them at an early stage and, if necessary, to take appropriate measures.